Jeremy Smith. Longman, 2002. ISBN 0 582 43836 5 . £19.99. JEREMY SMITH, a senior lecturer at University College Chester, sets out in this book to explain the origins of the Ulster conflict over the past century and various attempts to resolve it. Anyone coming fresh to the subject will find it very helpful. It comes with a useful chronology of events from 1798 to 2001, maps, a glossary of terms and personalities and an extensive ‘select bibliography' of books on the conflict. This short book is certainly not an exhaustive account of the toings and froings that brought about what has become known as "the peace process". It's more an overview of attempts to solve "the Irish Problem" from Partition in 1921 to date. The author takes a more realistic view of our conflict than many commentators. Ulster is not inhabited by uniquely quarrelsome people as can be seen by the outbreak of similar problems all over Europe and ex-Soviet central Europe since 1989. Smith is also realistic about the intentionally ambiguous nature of the Good Friday Agreement itself. As he said, "momentum in the process could be sustained only by `sleight of hand' and flexible terminology to enable to elide over what seemed unbridgeable differences while preserving their fixed ‘public stance’…" (p 7). Even the phrase 'peace process' camouflages great differences. Unionists concentrated on the peace as a final settlement. The SDLP and Sinn Féin highlight the process as "a staging post in a still incomplete journey". There may be doubt over the future of the institutions of the Good Friday Agreement given the recent indications of IRA bad faith at Stormont, but it is still useful to see how it emerged from the conflict that dominated the last three decades of the Twentieth Century. Smith sets out the nature of the problem as he sees it - "a polarised society, divided upon the question of possession". To this is added the baggage of religious differences, perceptions of "native" and "settler" and overlapping economic disparities and identification with either Ireland or Great Britain. To Smith, stable political institutions will have to reconcile such divisions if they are to be "durable and effective". The author, in his overview of events in Northern Ireland after partition reflect the essential nervousness of the Stormont government as it sought to consolidate its power and uphold the status quo. All appeared tranquil by the mid 50s but tensions still festered and a "Profound anxiety continued to lurk at the heart of Unionism" (p 62). I think that there's a lot of truth in this. Although discrimination was never government policy it did happen and allowed a sense of resentment that produced the disloyal minority that the Unionist Party sought to eradicate. An opportunity to build a new United Ulster was lost. Later attempts at reform by the secretive, aloof and disdainful Prime Minister, Captain Terence O'Neill, failed. By the time his reforms were announced, a full-scale insurrection had broken out. The RUC were unable to hold the line and British troops were deployed to "keep the peace". They're still here - 34 years later! In 1972 Stormont was abolished. The British government assumed full control and spent the best part of three decades trying to get out of its own mess. Ulster's recent history is littered with failed initiatives. Sunningdale (1974), the Convention (1975), rolling Devolution (1982), the Hillsborough Pact (1985) before the present ‘peace process’ emerged in 1990 when Secretary of State Peter Brooke signalled that Britain had "no selfish strategic or economic interests in Northern Ireland". The author's analysis of unionism since the Hillsborough Pact of 1985 and of republicanism since the 1981 hunger strike is virtually flawless. Before the hunger strikes, Sinn Féin was a stale mouthpiece for the IRA. Yet it grew into "a powerful, community-based, media-sensitive and tactically astute Republican movement…" (p115). The plight of prisoners in Long Kesh and Armagh "broadened the battlefield" for the Provos, and gained them widespread international sympathy. Margaret Thatcher, the Prime Minister, thought that the IRA had played their last card and lost. However, the Iron Lady had won a Pyrrhic victory. Bobby Sands was elected to Parliament and "Britain's international standing was severely dented, particularly in the USA': Some 150,000 people turned out at Sands' funeral. Sinn Féin went on to gain 13.4% of the vote in the 1983 general election. Mrs Thatcher was Sinn Féin’s political midwife. By contrast, this "wicked, Treacherous, lying woman"- a self-proclaimed ‘unionist’ - who once declared that Ulster was "as British as Finchley" took action that would irreversibly weaken unionism. The Anglo-Irish agreement was a Pact between two governments, so it was beyond the reach of unionists. The so-called 'unionist veto' was finally nullified by their false ‘friend’- the Iron Lady. It was these changes - the politicisation of republicanism and the gelding of unionism - that led to the present peace process with all its twists and turns. Get this book! Some of its conclusions and assumptions may be questionable and some of the author's descriptions grate a bit! For example, "Whitelaw found himself embroiled in a 'lose-lose' situation, looking like the limp red rag tied to the rope of a tug-of-war match" (p 98). Ouch! Still these are minor criticisms. 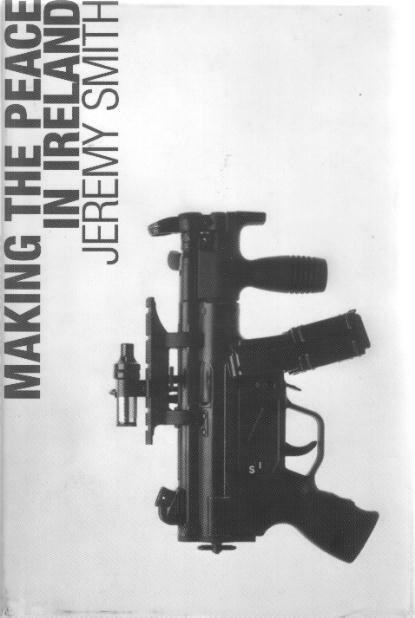 If you read only one book on the ‘Peace Process’, you should make it this one.